Friday morning, I arrived at the hospital bright and early for my surgery. In the parking garage, I asked Tom to take a photo of my neck pre-surgery. Tom and I were taken back so I could be prepped for surgery. My mom was able to join us a little while later. 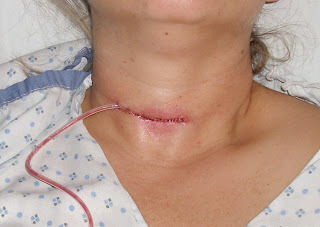 The surgeon came in to draw the incision line on my neck. I was beyond nervous, but very confident that in the end everything would be ok. Some "happy drugs" were administered before I was taken into the operating room. I remember being moved to another bed and having a mask put over my face. The surgery went well and the preliminary pathology report came back negative. I had some really rough spells throughout the day on Friday, but by Friday evening was feeling ok. I was able to get up and move around (pulling the IV behind me). By Saturday morning, my incision was already looking better. The drainage tube was removed and I was released from the hospital by 1:00 on Saturday afternoon. Feeling was starting to come back though and my neck was feeling really tight. It is very uncomfortable to swallow and talk. This morning, I could see even more improvement. It's so nice not having anything attached to me! Thank you to everyone for all of your prayers and thoughts during this time. I really appreciate it! I am so glad to hear that all went well! Sorry you didn't feel well, but glad your on your way to recovery! I am continuing praying for your recovery! Thanks for the update! Amy, so glad to hear the surgery went well and you weren't in pain too long! Glad you're healing quickly! So sweet that Tom thought to get you flowers! Have a good rest of your day! Amy, I am so sorry to hear about your surgery, but thrilled that all went well. Praying for a super speedy recovery! Ouch! I am glad that the surgery went well and that you are healing well! Love the flowers too :) Hugs my friend! Love the before and after photos! I think that incision will heal up really well and will hardly be noticeable. Keep it slathered up with healing stuff. I am so happy that things went so well and that you are recovering well. Wonderful that you documented the surgery. Amy, sooo happy that it went well! You are so brave! I would have been a wreck. I will continue to pray for a speedy recovery!